I believe my reports and columns stand on their own merit. We are independent; however, what I understand is that factual reporting is not always balanced – nor should it be. This is certainly true of West Virginia’s dependence upon the fossil fuel mono-economy. The Mountain State has a long history of being exploited by the energy extraction industry. While it has provided the dignity that accompanies work, it has also caused tremendous harm to people and the environment. While it is important to acknowledge the dignity that comes with any work, it is also vital to acknowledge that coal, gas and oil companies virtually have unlimited resources to disseminate propaganda. For more than a century, the industry has exerted inordinate influence upon our political bodies. That is why is incumbent upon the press and media to counter those influences. Clearly, the pages of the Clarksburg paper don’t offer such a counter-balance. We all know the history of coal mining disasters. Now, mountaintop removal has been proven to cause harm to human beings. The same is true for fracking and the related pipeline development. These are scientific facts which we ignore at our own peril. That does not mean that I deny that there have been some limited benefits from the energy extraction industry; nevertheless, present facts and the well-documented history of the industry prove that any benefits are far outweighed by the misery experienced by the people of the state and region, as well as the damages done to our sacred landscape. The first energy extraction industry in the state was logging. Erosion, flooding and ugly landscapes were all that was left after the industry finished its work. To this day, a hiker accustomed to marveling at 150-year-old oak trees in the Pisgah Forest of North Carolina will struggle to find similar majesty in West Virginia’s forests. Next was the coal industry, the history of which I have written about extensively. While one benefit of the industry is that it has provided jobs and the dignity that accompanies most work, many of Appalachia’s miners died (and are dying) from black lung disease. Hundreds of coal mining disasters have taken thousands of lives. In the early days of the industry, which occurred during America’s Gilded Age in the late 19th century, the unholy alliance among robber barons and politicians corrupted democratic institutions, allowed just a few to control the means of production and transportation (railroads), and created horrendous working conditions for miners. This continues to this day as anyone paying attention knows (e.g, the Upper Big Branch disaster and all of its related fall-out). Also, William C. Blizzard’s book “When Miners March,” – as well as several other books, documentaries and movies – provide accounts of how industry leaders and elected officials colluded to conduct a literal war upon coal miners. Furthermore, we know – as fact – that burning coal is contributing to climate change. Finally, the modern practice of mountaintop removal mining has led to destruction and misery for everyone impacted by it – unless one owns the mountain that is being blown up. Furthermore, the coal industry has unlimited resources to spew forth its propaganda and to use teams of lawyers to intimidate and threaten its opponents. So, we are seeking to balance that with factual reporting about the many negative aspects of our state’s reliance upon a the fossil fuel mono-economy. In addition to providing balance, it is my hope that our reporting will also challenge readers to consider that perhaps we need to reconsider our priorities – to question whether profits for a few should be allowed to trump the need for clean air and water; safe and peaceful communities; and, again, the sacred nature of the wilderness and its ecosystems. Most recently, we have seen the assault upon people, property rights and the earth by the gas companies and their partners, such as Duke Energy. When I was a student at Notre Dame High School in the early 1970s, I was part of the debate team. I learned then the value of a healthy debate. So, I welcome the exchange between our publication and the Clarksburg newspaper, as well as the insights shared by many readers of our blog. We need a debate in our community, the state and nation about the role of journalists. This is more than a debate though. This is a teachable moment. Some issues simply do not deserve equal coverage of both sides, because the facts do not support such a perspective. In West Virginia, eastern Kentucky, southeastern Ohio, southwestern Pennsylvania, and southwestern Virginia, the facts are clear – powerful interests have removed the riches from the earth for their own profit, while leaving its people battered, bruised and impoverished. It has left its landscape forever scarred. Now, with the proposed construction of more than a thousand miles of pipelines to transport natural gas, the negative consequences could move into areas of Virginia and North Carolina that have, to a large degree, escaped the negative impacts of the energy extraction industry. Consequently, I do not apologize for adhering to the journalistic principle that factual reporting is not always balanced. Those who have had their well water destroyed by fracking, their land taken unjustly, or their husband and father killed at Sago or Upper Big Branch understand this. It would appear that the Clarksburg paper does not. Nor do many other publications that have compromised their integrity for profit. So, the question is, to what view of journalism do you subscribe? © Appalachian Preservation Project, LLC, 2015. The Appalachian Chronicle is a publication of the Appalachian Preservation Project. The Appalachian Preservation Project is a social enterprise committed to preserving and protecting Appalachia. If you wish to support our work, please consider becoming a member. The Appalachian Preservation Project is also handling planning for the “Preserving Sacred Appalachia” Earth Day conference scheduled for April 20-21 in Charleston, W.Va. Learn about it here. HICKORY, N.C. – Lindsay Barrick’s latest body of work – “Fractured Sanctuary” – is part of her ongoing series dealing with the destruction of the natural world and the people who are called to aid in its reconciliation. The exhibit will hang at the Bethlehem Branch Library in Alexander County, N.C. from August 7 until September 25 as part of the Exhibiting Artist Series. She will also show at the United Arts Council of Catawba County in January 2015. Five years ago, the mixed media artist attended a social justice class at her grandparents’ parish in Bridgeport, W.Va. The topic was mountaintop removal. She revealed, “My life was rocked when I learned of the magnitude of the devastation.” Raised to be an outspoken advocate for environmental justice, she became especially passionate about issues relating to mountaintop removal and hydraulic fracturing. “Fractured Sanctuary” explores themes of demolition and insatiability, attempting to convey the ugly, dirty side of ‘progress.’ All works are one-of-a-kind artist proofs. A West Virginia native, she lives and creates in western North Carolina. She draws strength and inspiration from the ancient Appalachian hills and continues to work on an ever-expanding series that explores themes of destruction and reconciliation of the natural world. In “Fractured Sanctuary,” each piece was made using an etching press. Other than producing a block carving Christmas card in 1993, she had never worked in the indirect process. She took her first printmaking class with Thomas Thielemann in the spring of 2014. “Fractured Sanctuary” is the direct result of learning how to create monotypes, intaglio prints, and collagraphs at Caldwell Community College. 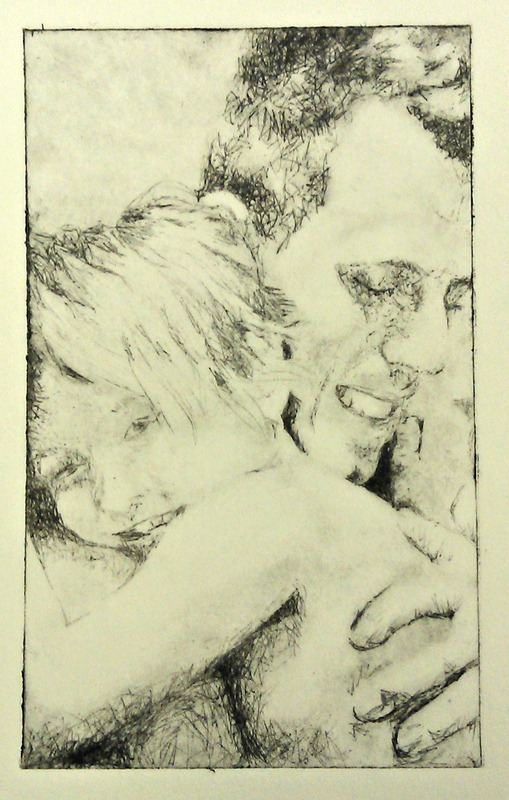 Most of the work was made on the Hickory Museum of Art’s intaglio press. Barrick said, “I am thrilled to partner with one of my favorite non-profits – Appalachian Voices – an organization which advocates for cleaner energy sources in Appalachia and the whole of America, particularly shining the light on the costs of mountaintop removal and hydraulic fracturing.” Ten percent of all sales will benefit the important work of Appalachian Voices. The artist was awarded a Regional Artist Grant by the United Arts Council (2012) and a full scholarship from Windgate Charitable Foundation (2013) to study encaustic painting from renowned artists Celia Gray, Elizabeth Tomasetti, and Fawn Potash at Penland School of Craft. She is in the process of converting an old garage into an encaustic and printing studio. Lindsay’s small-scale collages, made entirely from found objects and recycled material, were featured in the 2012 two-person show, “Up Close & Far Away.” Her work was selected as part of “Concertina, Interpreted,” an invitational exhibition at Caldwell Arts Council based upon North Carolina Poet Laureate Joseph Bathanti’s latest book of poetry. Lindsay creates from her Jazz Age home in the Green Park neighborhood of Hickory. She has studied with Jacquelyn Mate, Thomas Thielemann, Lynda Lea Bonkemeyer, Damon Hood, Jean Cauthen, and Mary Dobbin. As facilitator of the Hickory Museum of Art’s Open Studio, she often paints alongside other artists, including Kate Worm, Stephen Brooks, Matthew Good, Clay James, and Joel Kincaid. Barrick is a founding member of Harmony Arts Collaborative, the co-founder of The Boating Party, and a co-founder of Painting with Peers. She coordinates art projects for a local non-profit and is passionate about promoting and collaborating with other artists, writers, and musicians. “Fractured Sanctuary” is dedicated to the memory of her paternal grandmother, Minetta Lane “Sparky” Barrick – a life-long advocate for the down-and-outs and underdogs – and to her parents for their constant encouragement and deep love of the mountains. Lindsay’s niece Atleigh, who is already an artist at five, is a huge inspiration. The impetus for the work comes from Lindsay’s deep desire to leave the world more beautiful for Atleigh and those who will follow. © Michael Barrick/Appalachian Chronicle, 2014. (Note: Lindsay Barrick is the daughter of Michael Barrick).